We all brush our teeth regularly every day but the question is how good we are able to brush our teeth. The issue with the old styled brush is that it’s not easy to reach some spots of our teeth that we miss out in our everyday routine, it creates the problem in your teeth in long run. if you are cared about your teeth and looking for a better alternative to the normal tooth brush, here we are with the solution. -Standing charging is more hygienic. -Replaceable brush heads allow you to comfortably and cleanly use. -Adopt the spray paint process to make the handle surface more glossy with technology sense. -The wavy toothbrush head is able to clean hard-to-reach areas of oral cavity and remove dental plaque. 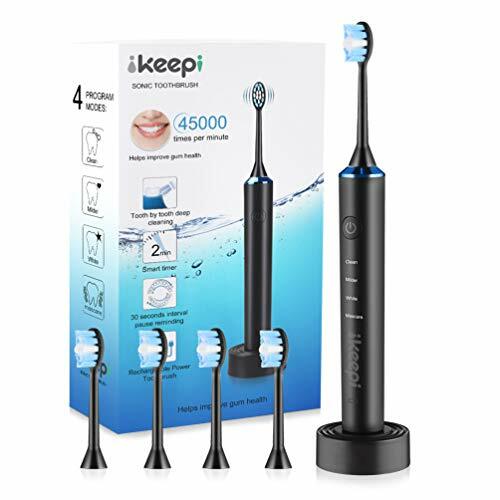 【Ultrasonic Technology】 Brushes up to 45000 brushstrokes per minute to remove more teeth stains and dental plaque, effectively preventing teeth decay. 【4 Brushing Modes】 Include clean mode, milder mode, whiten mode and massage mode, which improve the health of oral cavity and whiten your teeth thoroughly. 【2-Minutes Timer】 Reminds you to change the mode per 30 seconds, making it more intelligent for use and promoting your quality of life. 【USB Charging Base】 When the toothbrush is fully charged, the induction charging system will react sensitively and shut down automatically, which is safe and convenient for home or travel. One full charge for 15 days of normal work. 【5 Replaceable Brush Heads】 Comes with protective cases, which is more hygienic to protect your teeth and gums. Each brush head lasts 3 months so 5 will last for over 1 year.